LET YOU CHILD BE A “REAL MECHANIC”! with these tools and parts that are designed for young hands. The nifty powered screwdriver works just like the grown-up version. realistic engine sounds with a push of a button. Build the vehicle in many ways with sporty modification parts. The engine uses 2x AG13 batteries (included). The drill uses 2x AA batteries (not included). Flashing lights and realistic sound which attracts child’s attention for even more creative fun. Sound design is coordinated with led flashing lights. Easy to use electric drill tool to assemble and build the motorcycle of their dreams! Recommended for children 3 years and up because some parts could pose a choking hazard. FLASHING LIGHTS AND SOUND EFFECTS – Motorcycle vehicle flashes red light and has lifelike motorcycle sound when pressing the button. BUILD AND REBUILD – Includes a very safe low voltage drill, specially made for kids, makes the whole playing feel real and exciting with this “REAL DRILL”, It has an ASTM Safety Certificate for child’s safety, so you could feel secure about letting your child play with it. Easy to use for your little kids. 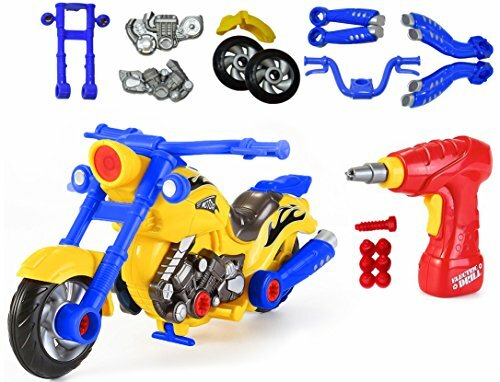 Teach your child about the joys of building with this DIY easy to assemble motorcycle toy building set. ENJOYABLE GIFT- Kids will love to play with such a thrilling and exciting toy. It will keep them busy and interactive all long. Give it to them upon Christmas, Holiday or their birthdays.